It is likely that the later die state is more scarce than the early state, and both combined equal an R2. There are a few gems at the top of the census along with a decent supply of AU's and other MS grades. 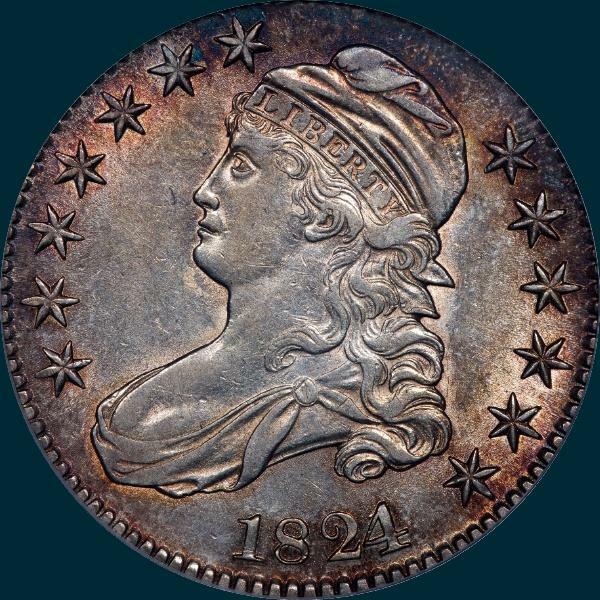 Variety Attribution: Obverse-1824 over 1. 1 shows near top of 4 on each side. Stars large and sharp. Date is a close 7 3/4 mm. with large 4 over 1. Serif of the overcut 1 shows at left and edge of stand at right of the top of 4. 2 and 4 nearly touch and are much closer than 182. 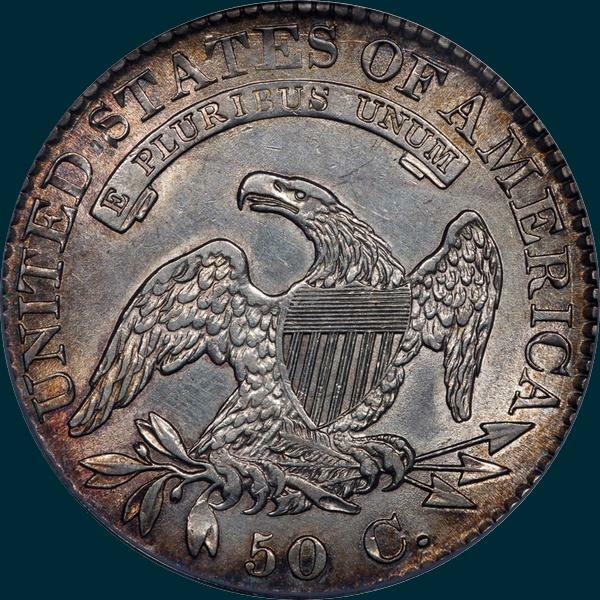 This is the only 24 over 1 found, although two other varieties are often mistaken for over 1, but are actually over miscut 4's. O-101: Reverse- 50 C. is 2 mm. and well centered. Arrow to A is 1/4 mm. Left sides T-I in line. The curved top of 5 is higher than 0. Center dot between crossbars 4 and 5. Top of U higher than N in UNITED. O-101a: Die crack from edge below U joining top of UNITED. Another top of ERICA and one at top of TES OF A.